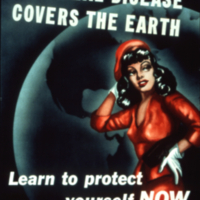 As the US mobilized for war there was increased concern about protecting servicemen from venereal disease. 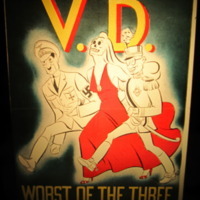 Syphilis and gonorrhea had been the number one causes of lost man-hours during World War I, and so concerns about VD were tied to those about military strength in the 1940s. Adding to these concerns were new statistics that painted a grim picture of the health of American men. 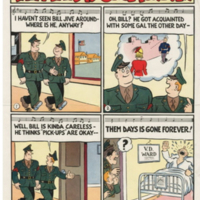 Along with the draft came the largest testing program in US history; every man who was drafted or volunteered for military service was tested for syphilis (and in some cases gonorrhea). The results were disconcerting. 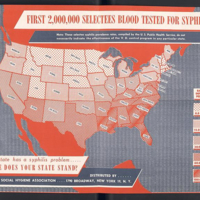 Even with the efforts to root out these illnesses during the late 1930s, syphilis in particular remained epidemic in parts of the deep South and Southwest. More materials than ever were created by the government, the military, and voluntary organizations like the ASHA to reach servicemen. 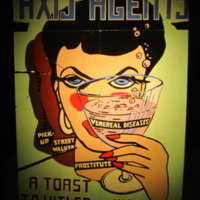 One reoccurring message was the danger of women, whether they were commercial prostitutes or “pick-ups,” women servicemen met at dances, bars, diners, or on the street. 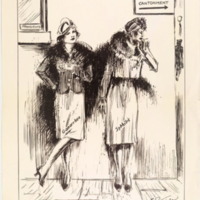 As seen to the right, women are ominously shown smoking in shadowy alleys or waiting in dark bars. 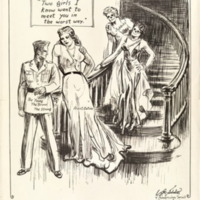 Comics, films, and posters undermined the idea that servicemen could tell “good” girls from “bad” ones in order to avoid contracting disease and instead emphasized that they should assume any (female) sexual partner had venereal disease. Thus, sexual women, whether professionals or “amateurs,” were depicted as the source of illness. Sometimes the diseased women appeared attractive and inviting, sometimes gruesome and unappealing, sometimes an eerie combination. 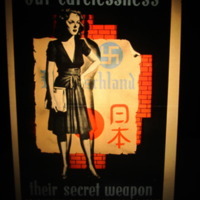 These women were also often represented as “axis agents,” helping Hitler and Hirohito by destroying the health of American soldiers and sailors. 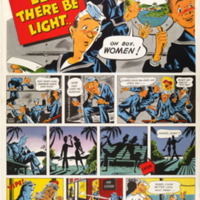 Some posters appealed to servicemen’s patriotism by reminding them they could not fight the enemy if they were sick in the VD ward after picking up a woman. Often, many of these materials conflated woman, prostitute, pick-up, enemy, venereal disease, and death through the text and imagery. Women with skeletal faces were a frequent symbol used to represent all of these ideas together. Sometimes, as to the right, she walks arm in arm with caricatures of Hitler, Mussolini, or a stereotyped Japanese figure. 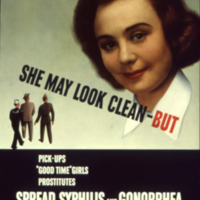 This focus on women as the vectors of venereal disease led to increased efforts to police their behavior and physically quarantine them in order to treat them for syphilis and gonorrhea. 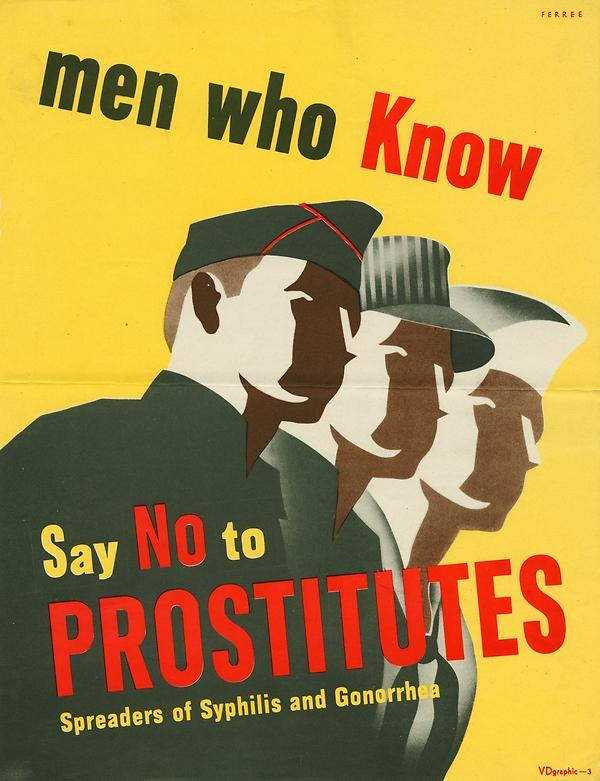 Arrests of women for prostitution and other crimes such as vagrancy increased tremendously during the war years. As a result, women could be forced to undergo an exam for VD and if found to be positive for one of the illnesses they often had to go to a Rapid Treatment Center (RTC) for treatment. Once admitted, a patient had to remain at a center for 2 weeks on average until she was noninfectious/cured. The government built a network of more than 40 RTCs across the country during WWII where tens of thousands of women were quarantined. While a few women challenged the exams and forced admission to the centers, none were successful. The government hoped more women would voluntarily enter the RTCs as the war progressed, but most were admitted forcibly via the courts or public health officers. The PHS created a film about the RTCs that painted the experience in rosy, patriotic overtones, perhaps in part to the public perception that they were more like a prison than a hospital.